I promised Richmond Sampler progress and I finally snapped some pictures! I finished the trees, flowers, bird cages, vines and chimneys on either side of the house. Birdie in the cage is over one...isn't he handsome? Sunflowers and pansies...all over one...aren't they darling? So unique! I will continue to work on the birds around the house (thankfully, they are over two!) and start to work on the queen stitches in the border. She is finally coming together! Welcome to my new followers! To new and old followers alike...thanks for all of the wonderful comments! You guys are the best! I've been waiting to see an update on your sampler! Gorgeous work - love all the over one. I always love how over one looks when it is next to over two stitches. I really want to do this beauty but those queen stitches are scaring me. For now, I'll just admire your lovely work and keep on thinking about doing it.... one day! Have a wonderful week, Valerie! 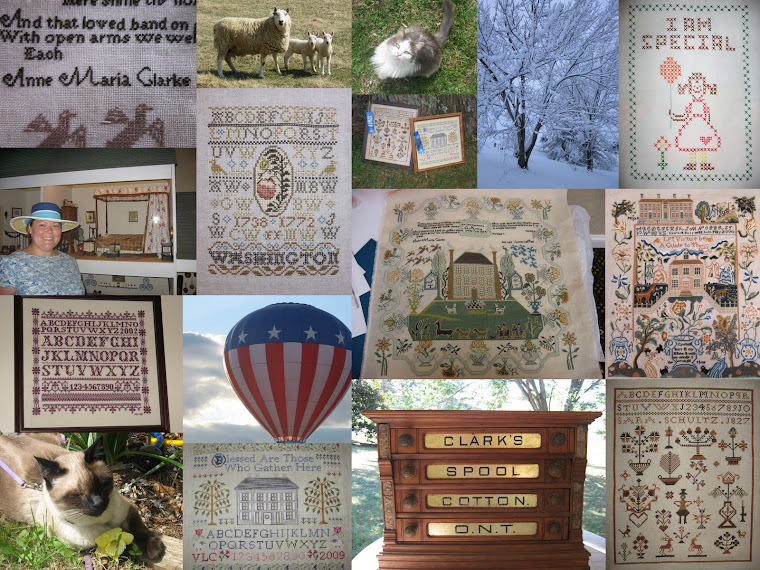 Isn't it amazing all the detail in this sampler! I love the birds in the cages and the big flowers in the pot on the right! Gorgeous work! Gorgeous sampler. I love the birds in the cages. Thanks for sharing the close-up pics with us... I didn't realize how much detail there was in this sampler. Great progress! She's looking beautiful. Your Richmond Sampler looks coming along very nicely!! I see there are a lot of pretty stitches put in since the last updates. Keep going! Way to go on getting a good bit accomplished on Richmond! Woohoo! She is looking stunning! Simply GORGEOUS!!! Thanks for all the close ups! What a stunning piece! I can't wait to see it completed! Great progress, Valerie! I love all the over-one sections. I think that my favorite motif is the flower urn with pansies and sun-flowers. Gorgeous! Beautiful progress on your Richmond Sampler! I love the over 1 details of the birds in the cages and the big flower pots. It's really coming along! Absolutely beautiful! I definitely look forward to your posts on this piece because it's so beautiful and your stitching is wonderful! I admire anyone who can work on over one with higher linen counts! Can't wait until next time - hope the Virginia weather is treating you well! Almost football season - Go Hokies! Oh, I've been waiting and your pictures didn't disappoint! It looks absolutely stunning Val! One of these days I would love to do that sampler. I am always afraid of the over ones and Queen Stitches, but seeing yours makes me know that I will definitely have to do this one day. You've made a great amount of progress! What a beautiful piece. All your close up pictures really highlight all the details. Will certainly be checking back to see your progress! So nice to see a progress pic of this beauty! It is looking lovely! Lovely progress! I don't envy you the Queen stitches. Good Luck. She's so gorgeous!!!! Thank you for sharing, I enjoyed looking at all the pictures. this is gorgeous...I also like stitching although I only do it on my handmade cards...I have a paper addiction, all things paper, shabby, blingie....hope your weekend is awesome. I am also a Virginia gal, stop by my blog for a visit if you have time! The Richmond is a spectacular piece - one that I will never stitch - but I certainly enjoy watching dedicated stitchers bring it to life! First Monday of Summer Break!